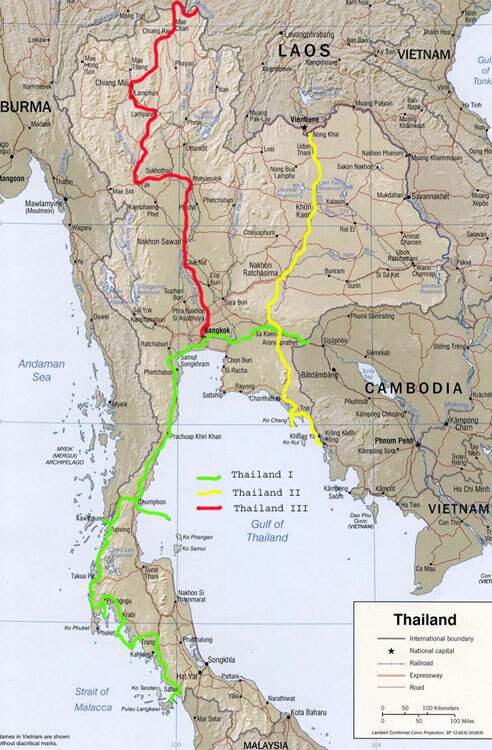 431 km of cycling - as part of a bicycle world trip - from the Lao border southwards via Chiang Rai to Chiang Mai, by bus to Sukhotai and to the capital Bangkok. 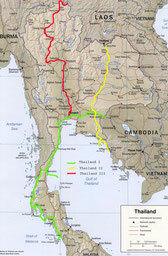 Do you like Cycling Thailand III? No one wanted to see a ticket, money either, so we went in vain with the tiny car ferry from Houayxai in Laos on the Mekong to Chiang Khong. Including our day trip to Myanmar, I arrived for the fourth time on this trip to Thailand. Again, the side mirrors were moved to the other side and so we went back along the left side of the Mekong along the northwest. About Chiang Saen we drove to Chiang Rai and just before the place was the kilometer display of my speedometer then five-digit: I drove the 10,000 km of this tour! After visiting some of the beautiful temples, we went on to Chiang Mai the next day. There we spent four beautiful days visiting temples, shopping at the night markets and setting up our photos from Laos and China. Slowly it was approaching, the end of my seven months Asia. In a week it should be so far, from Bangkok Steffi and I would fly over Singapore to Sydney. Unfortunately, we did not have enough time to cycle to the capital, especially as we wanted to see Siam's very first capital from the 13th century, Sukhothai. So we took a bus from Chiang Mai to Sukhothai. The next day we cycled and walked through countless and impressive ruins of former temples and city facilities. But time was pressing and so we drove two nights by bus to Bangkok. There it finally worked out with a third reunion with Reimund and Petra, who arrived on this day. We were very happy about that, so we celebrated this evening extensively with the last Thai Chang beers telling me until late into the night. It was difficult to get up the next day, but we had no choice: we had to cycle to the airport and say goodbye to Asia. Sure, I was looking forward to Australia, but I was sad too! I would miss it very much, the many often so infinitely friendly and open Asians, the cheap and above all fresh and delicious food, you literally freshly prepared on every corner! The very different landscapes, from dream beaches to Tibetan mountain peaks, the interesting cultures with fascinating, beautiful and partly monumental buildings! After a night at the airport in Bangkok and a night at the airport Singapore we finally left the next morning from Asia, on the way to Sydney!